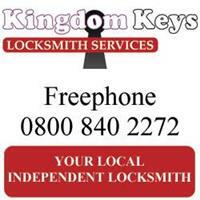 Kingdom Keys - Locksmith, Windows/Doors/Conservatories based in Hailsham, East Sussex. At Kingdom Keys we believe every Home is the Home owners Kingdom, Kingdom Keys operates a 24 Hour Emergency and non Emergency Locksmith Door and Window Repair Service for Homes and Businesses across Eastbourne, Bexhill, Battle, Hastings, Hailsham, Heathfield, Polgate, Willingdon, Dicker, Seaford, Newhaven, Uckfield and surround area's of East Sussex. with a professional, friendly service at very Competitive Prices. We are fully insured for peace of mind and give a full one years Warrenty on all parts so if anything was to go wrong, we will return and replace free of charge. If detained for any reason we will call you and keep you informed. For Insurance compliance and peace of mind, we offer Security Checks. You can call Kingdom Keys 24 hours a day 7 days a week. You can view our web site to find out more about us and the products and services we offer.